Booking a ferry to or in Denmark is simple, easy and safe with AFerry, just use the booking form above to get a price. The most popular route is Malmo to Copenhagen. 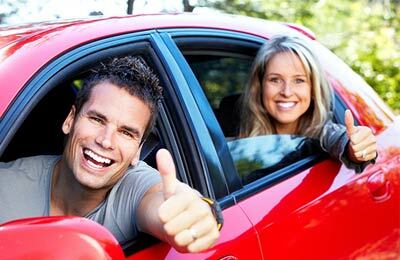 The average price this month for this route is £37 for a car and two people each way. Please note: As of 29th September 2014, the passenger service between Harwich and Esbjerg with DFDS Seaways has closed. Alternative ports in Holland and France can provide convenient access to Denmark. Booking a ferry to Denmark couldn't be easier with AFerry. You can either use the booking form at the top left of the page. The Scandinavian country of Denmark is situated to the north of Germany. Denmark is a beautiful country of lush, green countryside and rolling hills. 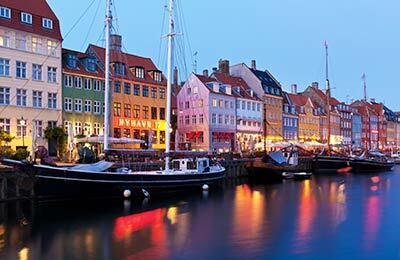 Denmark has a fresh climate and plenty for the visitor to see and do, including the popular Hans Christian Andersen museum in Odense and the vibrant culture and history of the country's capital of Copenhagen. In Jutland you can find Legoland which makes a great day out for the kids. If you want to explore more life size architecture you can visit the nearby village of Ebeltoft, which has cobbled streets and half-timbered houses. Travel north and you will find the beach resorts of Lokken and Lonstrup, which are famed for their artistic seascapes. 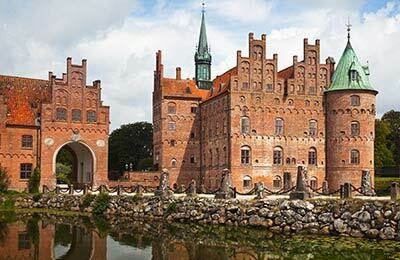 Famous for its colourful art and architecture, Denmark is also home to stunning countryside. To set yourself up for a day of exploring, it's a good idea to fill up on pastries, a Danish speciality. Denmark is located north of its only land neighbour, Germany, southwest of Sweden, and south of Norway. Denmark also encompasses two off-shore territories, the Faroe Islands and Greenland, granted home rule in 1948 and 1979, respectively. The national capital is Copenhagen. Denmark borders both the Baltic and the North Sea making Denmark ferry transportation key to its commercial success. If you take the ferry to Denmark from the UK you will arrive into Esbjerg in western Jutland. From here you can explore the beautiful varied countryside of the Danish peninsula with the flat farming areas in the west to the green rolling hills in the east. There are frequent ferry sailings from Kalundborg to Århus, Ebeltoft to Sjællands Odde and Ronne to Copenhagen, as well as many other domestic routes. The main cities on all islands are connected to the rail network including Ålborg, Copenhagen, Esbjerg, Herning, Horsens, Odense and Randers. Danish State Railways operate a number of express trains called Lyntogs which provide long-distance, non-stop travel. Intercity IC3 trains are faster and more direct. By car, traffic drives on the right and the road system in Denmark makes frequent use of ferries to cross between fjords and islands. Christiania, Copenhagen's `independent' hippy community founded in 1971, provides a home for those seeking an alternative lifestyle. You can visit the birthplace of the great fairytale writer Hans Christian Andersen in Odense and take a look around the Hans Christian Andersen Museum. In the centre you will find Denmark's beautiful Lake District near Silkeborg. In Jutland you can find Legoland which makes a great day out for the kids. If you want to explore more life size architecture you can visit the nearby village of Ebeltoft, which has cobbled streets and half-timbered houses. Travel north and you will find the beach resorts of Lokken and Lonstrup, which are famed for their artistic seascapes. Nice trip,but expensive just for a 45 min crossing! We always enjoy the Puttgarden- Rødby Ferry crossing. Only think is the cost seems to have increased rather a lot these days...£70 for a one way crossing! Quite expensive for just a short crossing , considering it only cost us £250 for a return ticket on a 6 hour crossing between Harwich and the Hook of Holland and that included a cabin too! Unfortunately, because of increased cost,our homeward journey is going to have to be over the Storebælt bridge,which costs considerably less . We enjoyed travelling with an unexpectedly pleonastic buffet in the restaurant. Breakfast, coffee and tea should be included in the price. You can charge more fare to compensate.